There are Soup Nazis and then there are “neo-Nazis” whose faces just happen to resemble a bowl of clam chowder, and the beloved 90s sitcom Seinfeld had ties to them both. 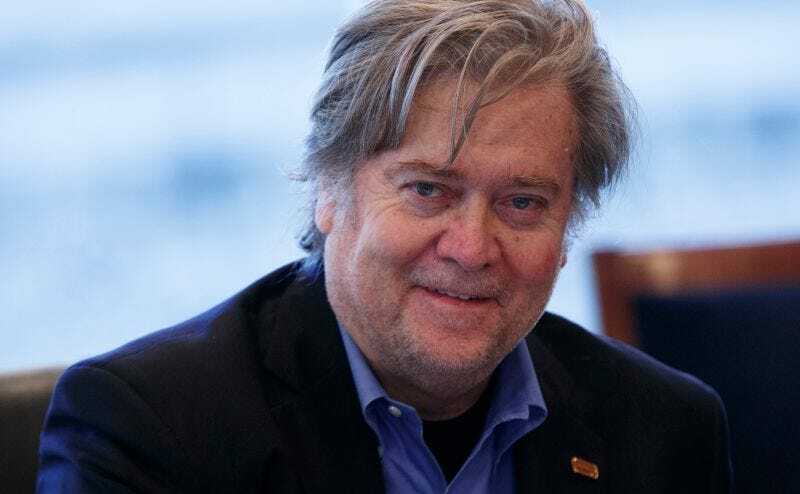 Much like the fetid cheese ball to which he has recently pledged fealty, former executive chair of Breitbart News Steve Bannon has amassed various financial investments in the entertainment industry (Andrew Beitbart once tenderly referred to him as the Tea Party’s Leni Riefenstahl”). One such investment was his early bankrolling of Seinfeld, on which he reportedly still collects royalties. Bannon has denied being an antisemite, but certainly the media organization he ran before taking over as Donald Trump’s campaign manager in August (he has since been selected as Trump’s chief strategist) is pretty antisemitic. As The Guardian helpfully reminds us, Breitbart once ran a headline calling conservative commentator Bill Kristol a “renegade Jew.” Bannon’s ex-wife famously testified in a 2007 court filing that Bannon didn’t want their children to go to school with Jews.